Read volunteer Graham Millett’s blog about his first Architecture Heritage Tour at the Pavilion on Sunday 13 May. This new programme of tours are led by volunteers who have been especially trained in the architectural heritage of our 1935 Modernist building. “My first official tour was on Sunday 13 May. Thirteen people attended and in my introduction I explained that this was my first flying solo tour. Front of house staff were very helpful and took care of my requests. They offered to shadow me on the tour just in case of any problems. As we went onto the auditorium stage, the front of house staff very kindly raised the curtain while we stood looking out into the auditorium, the effect was brilliant, a real wow moment for the those on the tour. None of the people had been backstage before, so to stand on the stage and have the curtain raised was brilliant. Hopefully this can be a regular feature of my tours when the stage is clear. I was pleased with myself as I did not use my prompt cards through the one hour tour, this enabled dialogue to flow between me and the participants and allowed questions to be asked without me being thrown off my thoughts. Feedback at the end of the tour was positive. Participants said they found it very interesting and educational. 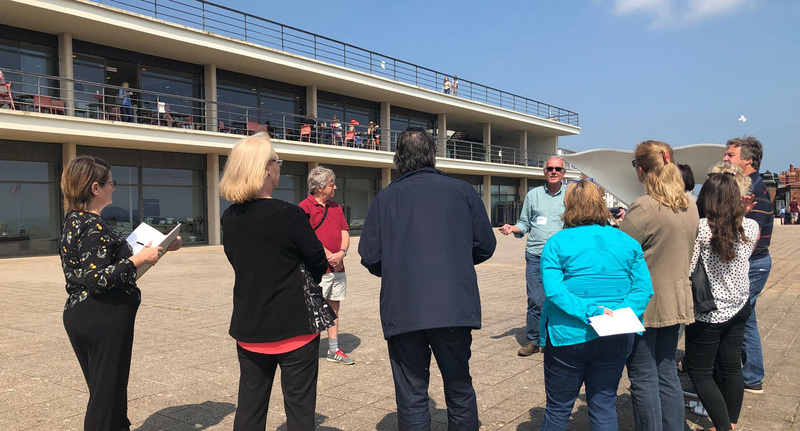 They were particularly pleased with the tour including aspects relating to the development of Bexhill from the 19th century, details about the De La Warr family and of course the modernist concept of architecture. Two people were so enchanted by the building and tour that they decided that they would become members! Support the De La Warr Pavilion and its heritage by becoming a Member here.